Ground flax seed not only provide you with Flax oil but provides you with nutritious fiber and it easier for your body to use and digest. 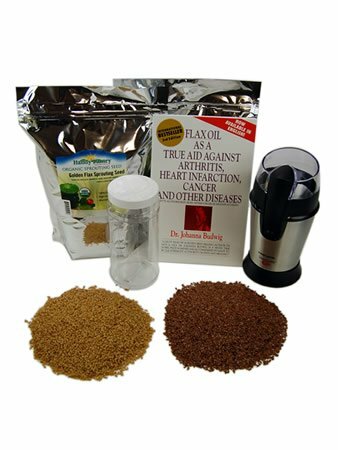 Flax seeds can be sprinkled on salads, mixed with smoothie, used in recipes, or even eaten as a cereal. Ground flax is an easy and super healthy addition to your diet. Ground flax is also an amazing egg substitute in recipes and baking (see below). Did you know that you can use ground flax seeds as an egg substitute in many recipes? Flax seeds are mucilaginous. That means that when they get wet, they form a thick jelly-like coating around the seed to protect it and keep it wet for germination. Ground flaxseed turns into a thick jelly like mass with the same consistency as an egg. When used in many recipes (baking mostly) ground flaxseed performs the same role as an egg in providing cohesion to the recipe, and its amazingly good for you. We bet you can't tell the difference! Try it in cakes, banana breads, pumpkin bread, pancakes, crepes and more. Flaxseed in place of eggs really opens up your options for vegan cooking and baking.